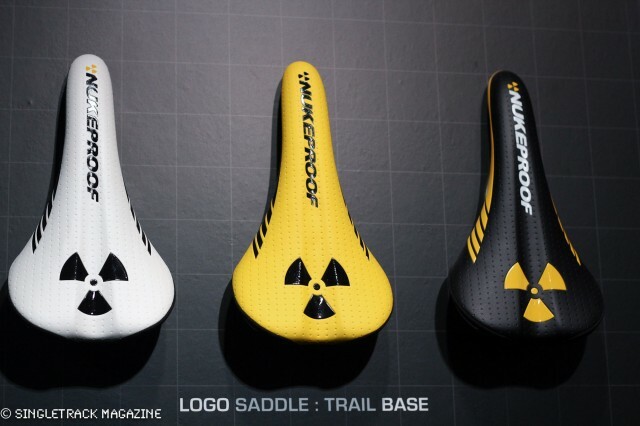 Although still in its infancy, the Nukeproof brand is going from strength to strength. 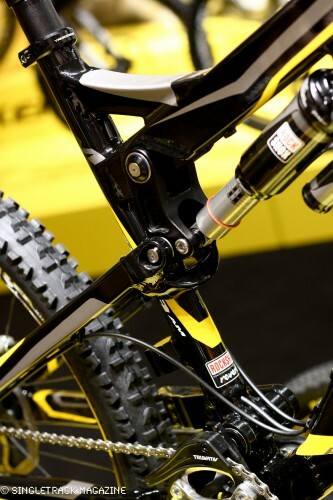 For 2013 they’ve built on their existing range, making lighter frames for the popular Mega, a full new downhill bike in the shape of the Pulse and filling in some gaps in their component range, including adding BBs, an angle adjust headset and some carbon bars. 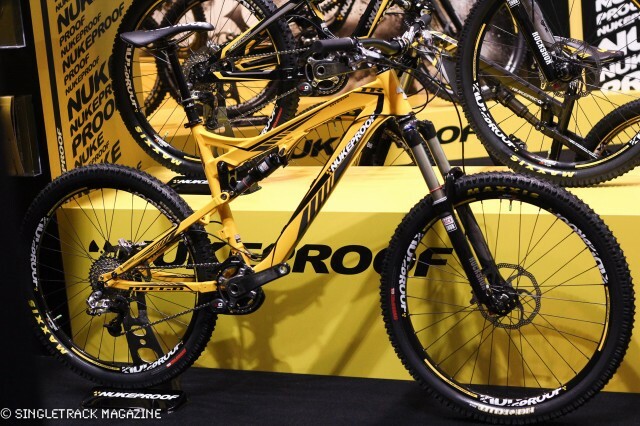 The Nukeproof Mega TR- 130mm of rear whel travel and up to 160mm up front, complete with new, lighter frame. 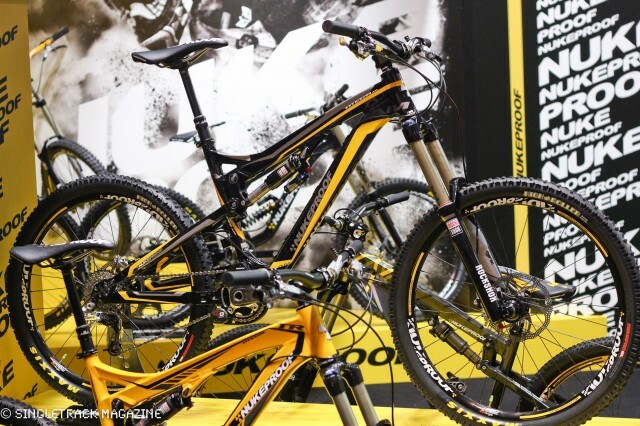 The Nukeproof Mega range has split into two bikes, the 170/160mm travel Mega AM and the 150/130mm travel Mega TR. Both have an all-new hydroformed and lighter frame with some very neat touches, such as the Reverb Stealth internal dropper cable routing, interchangeable dropouts and the production models will feature removable high direct mount front mech tabs for a super clean look when running 1×10. Production models will get removable front mech tab for super clean look. They reckon the AM is now a more balanced bike thanks to the 10mm bump in travel, better matching the back to the 170mm front end. 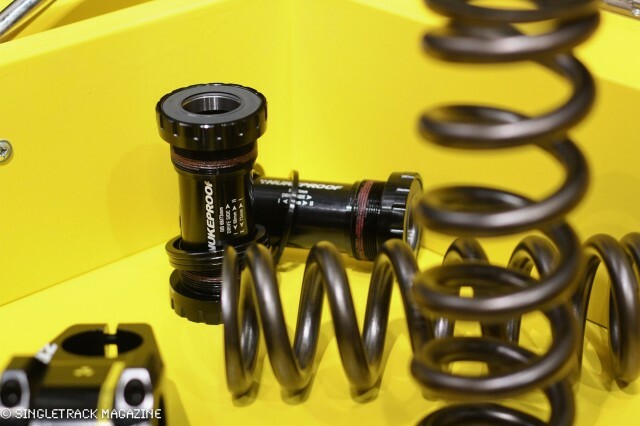 You now get a choice of shocks, with the Rock Shox Monarch Plus now available as an option. 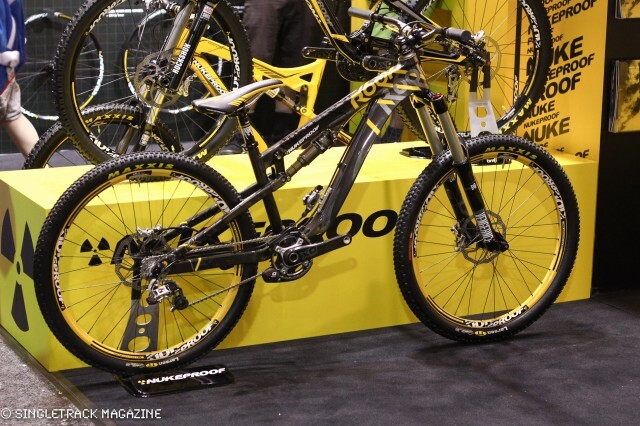 A complete bike will cost £3,600 complete with Rock Shox Reverb dropper post, Lyriks, a full SRAM X.0 group running 1×10 with guide and a selection of Nukeproof finishing kit. 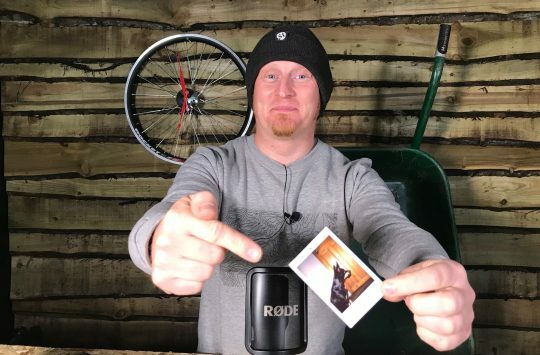 You can get a frame only deal at £1,300 which comes with a Cane Creek Double Barrel shock, which is a bit of a bargain. The Mega TR is, as the name suggests, a more trail focused offering with 130mm of travel at the back matched to a 150mm fork up front, though it’ll take a 160mm fork just as happily. The complete bike gets a pair of Rock Shox Revelation 150mm forks up front and it also features a 1×10 X.0 group and Reverb Stealth post. 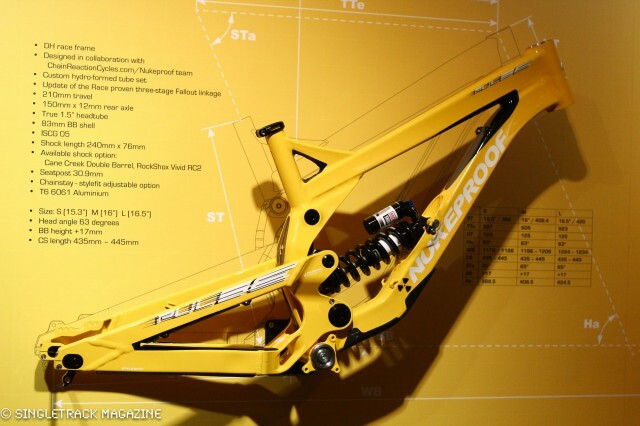 The Rook slopestyle frame has a integrated hydraulic gyro and looks like a rather nice play bike. 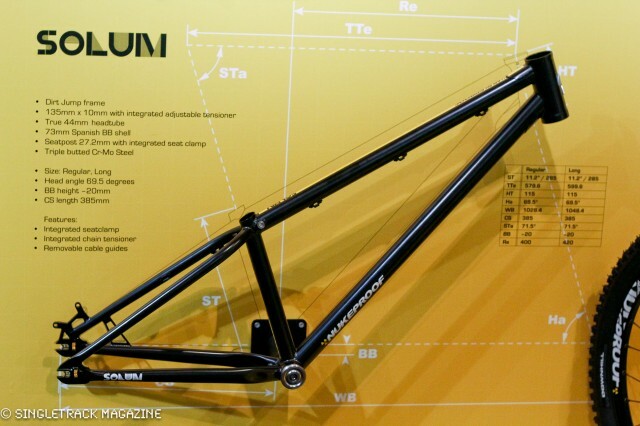 We saw the Rook slopestyle frame at Sea Otter, but it’s still worth a mention here. As well as the fact it’s got the first integrated hydraulic brake gyro out there for endless barspins/handletwirlers We got rather excited when it was pointed out that it’d run just fine with a set of 160mm forks up front, opening some possibilities for an interesting play bike. It’ll cost £1,150 for frame and shock. Steel dirt jump specific Solum has some nice design features. In more bikes-we-want-but-struggle-to-justify news, the Snap 4X hardtail has been joined by a fully fledged steel dirt jump bike called the Solum. 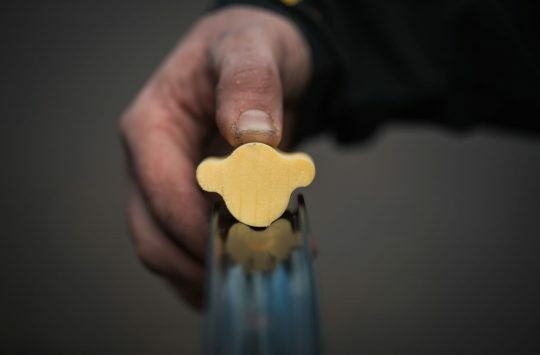 The guys at Nukeproof realised their team riders were using the Snap on trails as well as race tracks, so they decided to make something dedicated. It’s got a triple butted cromo frame, masses of standover, a 44mm ID headtube for full fork compatibility and some really lovely detailing such as the horizontal dropout tensioners, disc brake braces and the built in seatclamp. The new Pulse downhill bike - they're on trend with longer, lower, stiffer everything.. The highly popular Scalp has been replaced at the top of the downhill bike pile by the Pulse. 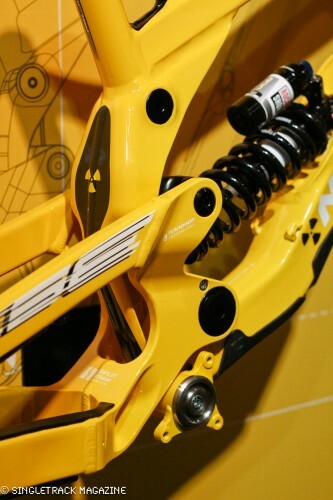 It’s an all new chassis, building on feedback from the Nukeproof/ChainReactionCycles World Cup team. The suspension platform is pretty much the same, using the linkage driven single pivot Fallout system and has gone up in travel by a whole millimetre, bring it to 210mm. The shock rate is a three stage affair, starting off progressively before a linear mid stroke and then giving a progressive bottom out. The cartridge bearing pivots are now doubled up and held in place by circlips to ensure a stiff back end and you can now adjust the wheelbase +/- 10mm with dropout chips. The top tube of the bike is now lower and longer with better clearance under the downtube as well. It’s running a 63° head angle but the full 1.5″ headtube allows you to run an angleset or similar to tweak that as you see fit. The suspension is pretty much the same, but the frame is totally revised from the Scalp. Two models will be available, the Pulse Pro at £3,999 and the Pulse at £2999. 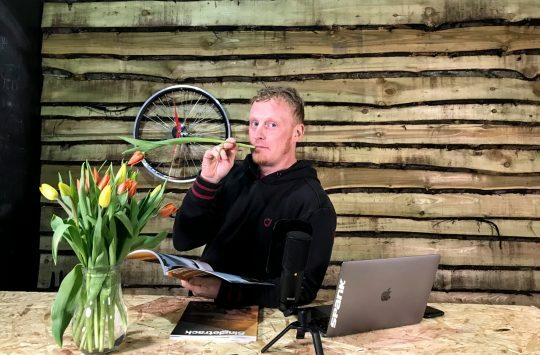 The Scalp isn’t gone for good however – it now forms the entry level downhill bike in the range at a very impressive £2,199 with Rock Shox Domain triple clamps. 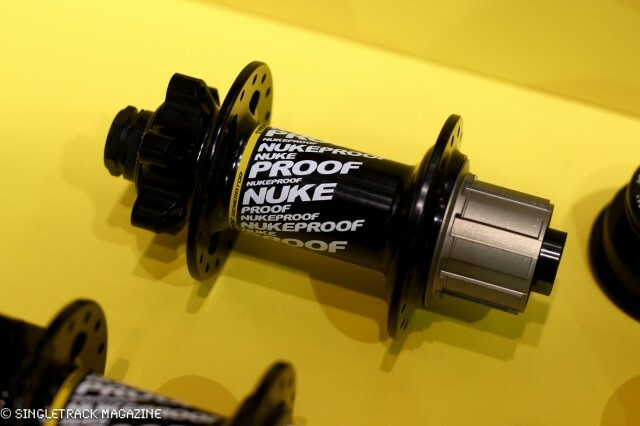 Nukeproof have always had a full range of wheelsets and hubs. This year they’ve added a 650B wheelset option for the early adopters out there and we also spotted this rather cool demi-size free hub which can either be run with a few gears or just one. All the Generator hub are interchangeable between the various standards too. They were also showing off this angle adjusting headset which fits in a proper 1.5″ headtube and will knock a single degree off your head angle – or add it back on if you want to be anti-fashion. It’s just for 1.125″ forks but we imagine they’ll offer more sizes in the future. They’ve added a tapered headset option to their existing range of cartridge headsets as well. 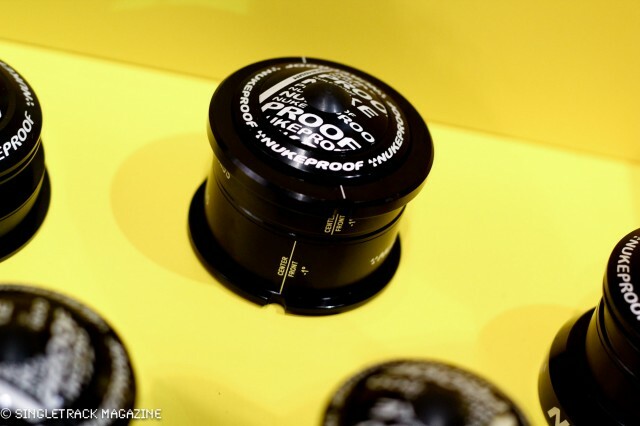 Also new to the Nukeproof bits’n’bobs range is a Shimano/Raceface compatible bottom bracket and they’ve reintroduced their range of Titanium coil springs, this time offering rate changes in 25lb increments. They’ll be available early next year. Their saddles have had a bit of a rejig, with a bit more padding to make them more comfortable on extended rides. There’s also a 760mm wide carbon fibre Generator AM handlebar to compliment the existing aluminium models. 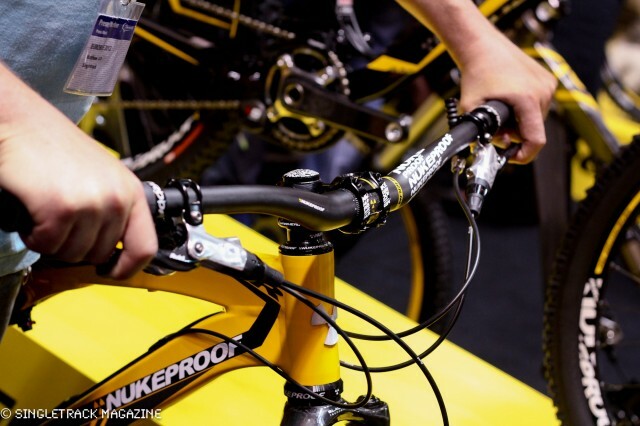 Interestingly enough, Nukeproof have got right behind the new 35mm handlebar standard and will be offering a range of bars and stems from next year onwards, which should provide a more affordable alternative to what’s already out there. 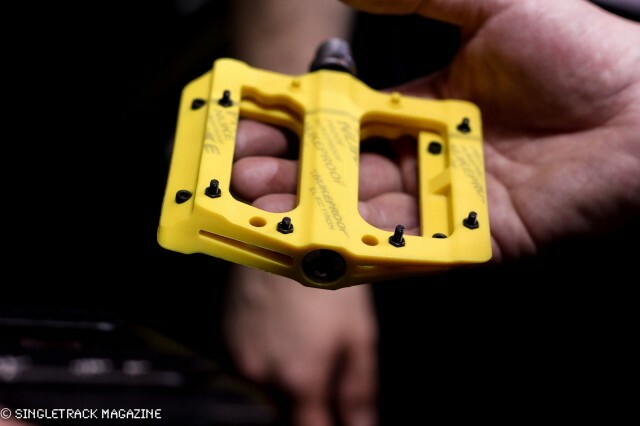 We always mention the Electron pedals, but that’s because we really like them. The composite body is nice and light, the bolt in pins are a decent length and they should be able to shrug off rock strikes without a problem thanks to their ability to slide over rather than clank to a halt. OMG that TR sounds and looks lush!